Visual aids often rank high as a tool for productivity in children (and adults). Visuals offer clear and concise directions for success. They can allow for increased independence, which in turn can be very empowering for our children. Just to clarify, we do not utilize rewards in our homes, these are simply visual aids that encourage independence and success. For some children, following a bed time schedule is easier than having Mom or Dad directing every move, and its also nice to have if you are trying to put multiple children to bed at the same time. It's not imperative that they do each step in succession, its just something that assists them along the way. 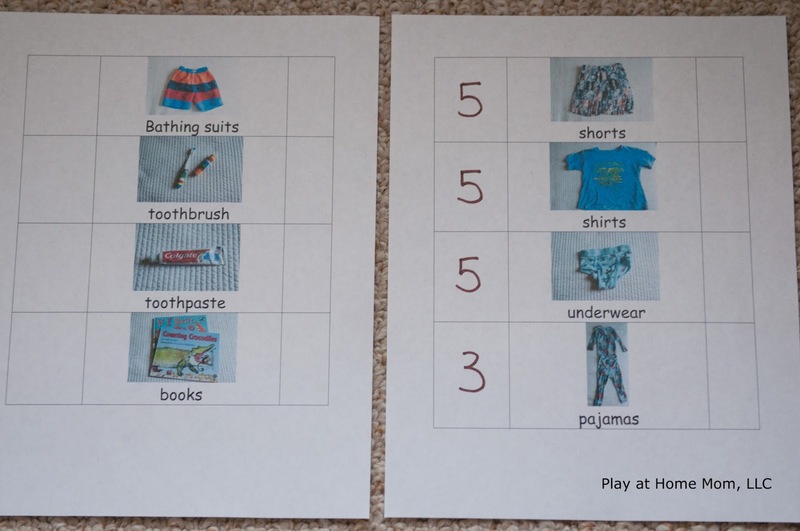 The routine is printed and laminated so it can be used each night. The child checks off each task as its completed. 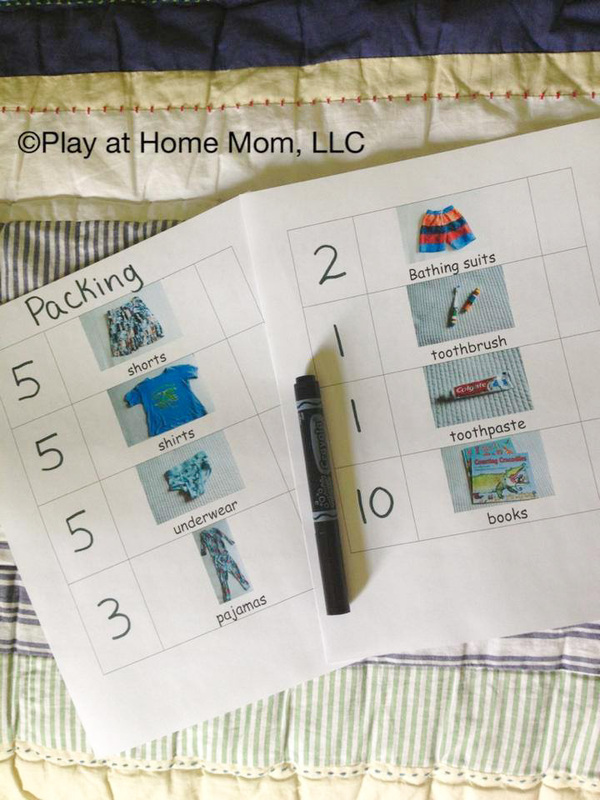 Another tool that is fun and encourages independence is creating a packing list for our children to utilize prior to vacations, school days, camp, etc. For children who are not reading, take pictures of each item that needs to be packed (or use clip art). 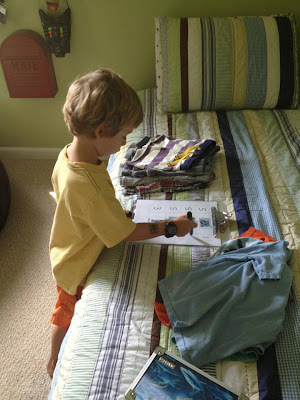 You can also have the child take an active role in creating the list - they can draw and/or write items to be packed. This is the visual list I created for our upcoming trip. The printable is simply a chart. In the middle I added the picture and name of item to be packed and left the other two blocks blank. 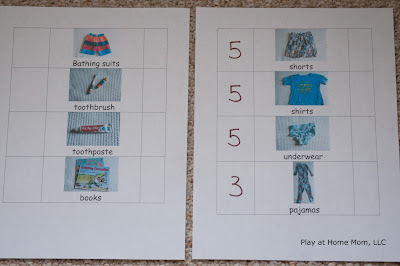 If you laminate it, you can then write in the number (cause this may change from trip to trip) and the child can check off each item as he/she adds it to the bag. Of course, the number of items are always negotiable. Visual packing list for my son. Packing and checking off the list. For a free bed time visual template click on the links below. The template includes a chart like you see above with 10 options for pictures. this is a brilliant idea- thank you! Amazing post, I am happy to read your blog, Thanks for telling us some different ideas. Your post will be helpful for all. Your post is easy to read and easy to understand. Keep sharing more and more post with us. play at home is a beautiful blog thanks for sharing articles here.